This week there were so many ocean goodies on our calendar and hood #4 has been looking at fish for school. So we went over to the aquarium website and decided that we would make our own aquarium for this weeks craft task. So here you go: Se7en crafty ideas that you can use for any theme, we just happened to be having an underwater week. Idea 1: Marble Painting and Deep Sea Tanks This is great fun and you can use paper and paints or fabric and fabric paints (we have made fun bandana’s doing this). 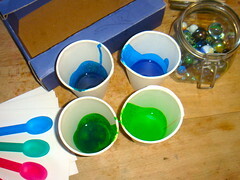 You will need an old box, paint in cups – we used sea colors, a couple of marbles and spoons. 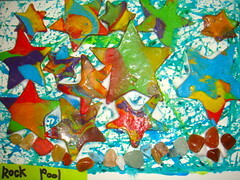 Step 1: Pop your paper into the box and your marbles into the paints. Step 2: Fish your marbles out of the paint. Step 3: And drop them into the box. Step 5: You are done and we had a couple of deep sea tanks to fill. I love the way no two are ever the same!!! Plasticine is not exactly play do, but I am sure you could use play do. Plasticine is an oil based modeling clay that has a stiffer texture than play do and it is really cheap in our supermarkets. 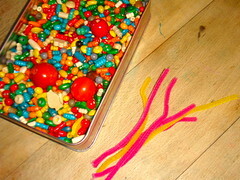 Step 1: Split the plasticine into brightly colored clusters. Step 2: Roll them into balls. Step 3: Flatten your balls with a rolling pin – or we used jars. 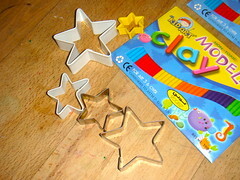 Step 4: Use cookie cutters to cut out your shapes, we used stars for starfish. Step 5: Lift them off the surface carefully with a lifter. Step 6: And we put our rock pool together… using little stones from the scratch patch. And there is not enough white glue in the world for some kids!!! But never fear when the glue dries your starfish will be bright and shiny. Step 7: And you are done… with the rock pool. 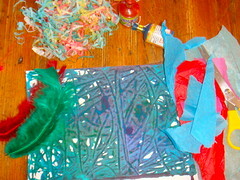 Tissue paper, colored feathers and party poppers were the name of this game. 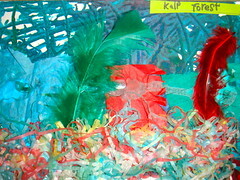 Step 1: Snip the tissue paper to make some feathery kelp. Step 2: Stick and Glue. Step 3: And your Kelp Forest is done! 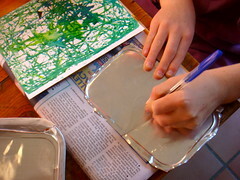 We used some foil trays and a ball point pen, and newspaper to press on. Step 1: Pop the newspaper under the foil so that you get really strong lines drawing with the ballpoint pen. Step 2: Cut your sharks out with kitchen scissors and your shark tank is good to go! 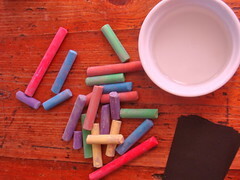 A little trick for drawing with colored chalks is to dip your chalks in sugar water while you are drawing. The colors don’t fade and go powdery when they dry, the colors stay bright and funky even after a while. 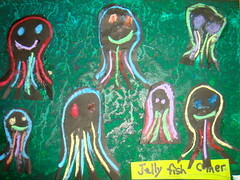 Step 1: Draw your jelly fish on dark paper and cut them out making those tentacles all feathery. Step 2: Your Jelly Fish Corner is done! Step 1: Thread some beads onto your pipe cleaner. Step 2: Bend the pipe cleaner into a fish shape and twist the tail round a few times so that your fish stays together. And add some more beads to the tail. 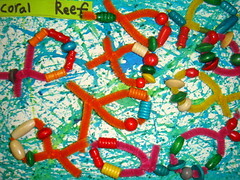 Step 3: And your coral reef is done! We used wax crayons and food coloring as ink. 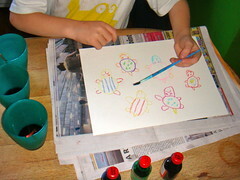 Step 1: Draw your turtles and decorate the shells with bright wax crayons. 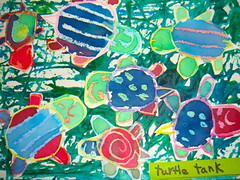 Step 2: Paint in your turtles with inks. Step 3: Cut your turtles out when they are dry and stick them down. Your turtle tank is done. That’s enough already! If you are looking for more ocean craft ideas have a look at our Shark Craft, Surf Boards or our Underwater Party. Prev Happy Birthday Hood #2 and an Interview. WOWSERS! This is delightful. As always your projects are wondrous!!!! Loving the underwater party theme too!!! Wowsers indeed! Hi KM, this took most of the week – everybody had to try everything… great fun!!! I love your guitars and rainmakers… Hope you all have a good week! How cute! I bet your kids had a blast! Hi J, This was a good one! Lots of time spent together, creating together!!! Have a Good Week!!! Hi E, Glad you liked it, thanks for stopping by! Have a great weekend! Love love love these projects! So beautiful and the theme would work for many ages! Thanks for sharing! Great ideas! 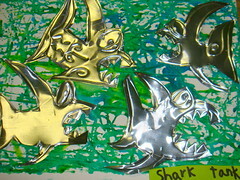 My 4-year-old daughter is obsessed with sharks–we love your foil sharks and will be making them ASAP! Thanks! Seriously this is the coolest project I’ve seen in a long time!! I LOVE it and am going to try it with my daughters. Hi DFW, Glad you liked it, thanks for stopping by! Have a good week!!! Shark Attack Craft in Se7en Steps. Hi There A, Thanks so much for stopping by. We love doing projects and it is so great you came by to admire it!!! You have a great week. Hay C, Thanks for stopping buy! I am so glad you liked our crafts! I popped over to your site – and love all the projects! You have a good week! My first visit to your blog. Wow!!! I am impressed and fascinated by your interesting adventure- raising your family so naturally. Will definitely visit again. We are homeschooling two girls, aged 10 and 12 in Wellington. Always looking for interesting moments/ people to learn from. Keep well. Hi A, Nice to meet you all the way from Wellington!!! I hope we have lots of fun posts you will like!!! Have a great weekend!! !